George H Bush AKA George Scherff a )ew . There is no George H Bush. About 5 years ago, I figured it out. I said, they are going to wear us down with Obama and send in the knight in shining armor on the white horse to save the Republic. Then they will spend the next term or two wringing their hands that they can’t undo what Obama did, the chief hand-wringers being FOX News. My exact words. They being the Jesuit orchestrators. I studied FOX News the whole time with the Gulf War and G W Bush. I have been watching the news media, how they report (or don’t report) things since I was about 14 or so, and that was in the 1960’s. It was because of a religious liberty case that I had personal knowledge of. As in DETAILS that never made it onto the news. Yes, this is the Jesuits at w ork. It has been since Lincoln was assassinated. They got their foot in the door, but their whole body in the door with Wilson. Concentration camps is their brainchild. They invented it. The RCC has never rescinded the Council of Trent. It holds everything in the Bill of Rights as anathema, damned to hell. Vatican II was smoke and mirrors, as is the ecumenical garbage, which they pulled before, the last persecution of the Christians in Rome was an extermination. THese had been on the list to be murdered the entire time the Edict of Toleration was in effect. It gave them time to ID everyone. Then the history books tell us that “CHristianity” won. Look around you. It didn’t. You can call them whatever you prefer, but the connection will become clear at some point. The New World Order is the Old World Order making a comeback. THe Romans were equal opportunity enslavers. Today’s “Romans” have very special hatred for the real Torah Jews (the Biblical kind, not the Talmudical), and the White Protestants (the old timey kind which are becoming rare.) They have shackled us to this THING called Israel, when Israel actually is the Lost Tribes. The Jews are Judah. Read in the Bible. Rothschilds sold out their country (they were the Sanhedrin Jews) and cozied up to Rome. It was a mutual thing. They intermarried over the centuries with the aristocracy particularly the elite families of the ancient Senate who supplied the Popes. This goes back a LONG way. The Mystery Religion was in the Simon Magus cult which they desired to use as their power base in Rome; it was also in the ruling class of the jews, they brought it back with them from Babylon after the Exile. Europe went into shock when they found the Antioch manuscripts which showed the Vatican manuscripts had been altered and had verses deleted. Etc. The Protestants came within an inch of bringing down Rome, and the Arabs were at the harbors, they had to buy them off with the treasure of Malta (or some of it). The Templars. By the way, Freemasons are infiltrated since the 19th century, when they got the last American lodge. They were the original resistance. Mystery Religion came from the pre-flood civilization which the Bible briefly mentions. It was based in India, which was the only place where the Apostles failed. By the 6th century (the time of Mohammed, whom they raised up to do their dirty work and wipe out the Eastern Christians and the Biblical Jews), –by that time, they had become so corrupt that they sent priests to India to learn the Black Art. What these people were always about was witchcraft and mind control. Moses ran into the same stuff in Egypt, and got his people out! Which are basically the same thing. Loyola’s SPiritual Exercises are a good illustration of the organized introduction of this stuff at beginning level. 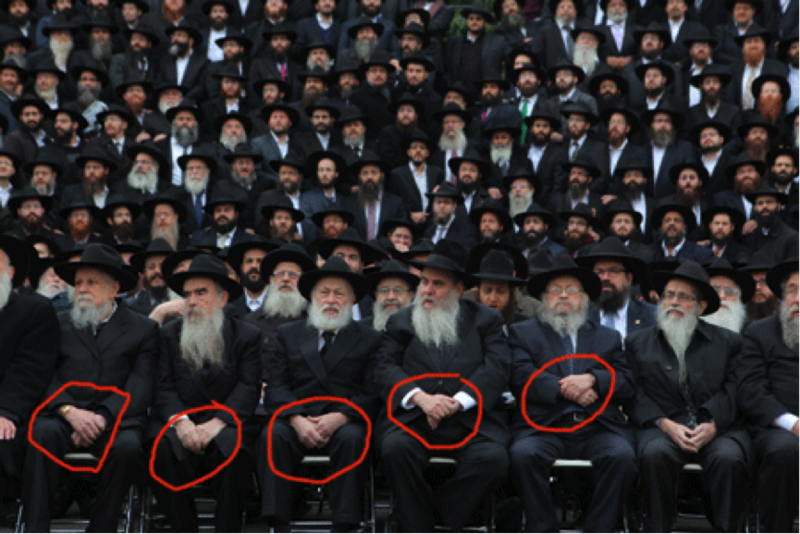 The Jews in the “state of Israel” are Talmudical. In fact, they are about to pass a law that only the Talmud is real Judaism. THey mistreat CHristians, and unfortunately the Fundamentalists and Evangelicals in this country are in the dark about that. THis was accomplished by the Jesuits of course. I could write more. So what we are facing is probably a law that the only CHristianity is Roman Catholicism, if this crap is not stopped. Don’t kid yourself. Trump LOVES these men in skirts. Just keep your eyes open and WATCH. Clintons are useful idiots, most of these big Dem’s were ALLOWED to build up. It’s all been planned. Get out of the Republican vs. Democrat paradigm, if it’s not too late. It’s called the Hegalian dialectic, and they probably invented it, actually, go back and study how Rome dealt with its colonies, the “divide and conquer” strategy. Why do you think the tribes sacked Rome? THey weren’t stupid. They had a sense of their identity. So they don’t make that mistake any more, of letting people have their cultural identity. When yo come to a country, you should assimilate or go home. They don’t want that idea to be considered. I doubt Trump is some sort of Cyrus. i think Mark Taylor is a Zionist shill. And I’m pretty sure it WOULD be dangerous to go into certain neighborhoods and say that. I don’t have any trouble with that idea. Where I grew up, everyone was either Baptist or Catholic. Talk about being between the rock and the hard place. Actually the average lay Catholic makes a much better neighbor at least in this state! The not so funny joke is, the Baptists are more Catholic than the Episcopalians. They just don’t realize it. They have been their best tools in the last century. The Methodists held out for a while longer. They always were a cut above. It’s always been about religion, in any sense, broad or narrow. Even just good versus evil. IT’s about the definition of Christianity. What it is, and what it isn’t. And that ain’t it. There would be a big change in the world overnight if people would stop calling things CHristianity that are not. You can damn sure bet not a peep about going after the Oppenheimer’s or Rothschild’s gold or diamond mines. We all know who’s behind all those communist groups. Divide and conquer huh? Let’s do it!!! REVERSE TALMUT!!!!! Divide every SHEKEL, every oz. SILVER and GOLD stolen from their inbred greedy fingers. And free all those kids held in dungeons used for mk-ultra, snuff films and organ harvesting. BLOOD LIBEL!!!! We’ve got lots of vaccines and FLOURIDE for them while we’re dividing and conquering their asses. The Rothschild’s control 52% of our FEDERAL RESERVE. The Oppenheimer’s thru Lehmann. We know exactly where that money came from. They printed it. And the greedy maggots charged us for it. They killed 7 U.S. Presidents-4 by poison, 3 by bullets. The secret societies that do their dirty work are NO secret. They’re traitors to every nation and especially to humanity. Hate has no boundaries. Jewish oppression was big in the old USSR. Please get up to speed on that. Jewish oppression was Bolshevik Jews, oppressing the Russians. Lenin immedietley brought in anti semite laws as soon as his arse hit the leaders chair! The Bolshevicks called them gulags, when they should be called concentration camps! Who ripped off the Russians in 80/90s? Those oligarchs you hear about are nearly all of the same tribe! They took control of anything that had value, exploited it, off shored it, was why putin was so pissed off & sent armed troops to collect tax money owed by many of them! You’ve been mugged off, something they often do, to escape notice! Go read up on it, you’ll be shocked! Don’t forget Hitler & Nazism, while you’re at it: just another ploy to found the state of Israel by recalcitrant Jews uninterested in the Zionist-Israel project. It’s no longer a secret that the “smoke them out by fright to Palestine policy”, to create a critical population mass for nation building, was funded and organized by Rothschild and other Zionist-controlled banks, some led by Zionist Jews & others by Zionist Satanists (ex, Bush, Carnegie & Astor families). Harvey Weinstein: ILLUMINATi-Zionists Hollywood “CASTING COUCH” Exposed!! Creep Oren Yoell – producer for Miley Cyrus. Daryl Bradford Smith with Muhammad Rafeeq, February 8 and 9, 2006. On Khazaria, Arthur Koestler’s Thirteenth Tribe, Ashkenazim, Sabbatai Zevi (Shabbetai Tzvi), Young Turks, Dönmeh, Crypto-Jews, Frankists, John Kaminski, Ezekiel, Baruchia Russo, Jacob Frank, Isaac Luria, Lurianic Kabbalah, Hasidic Jews, Rothschilds, Hönig Family, Dreyfuss Affair, Israelites, Hittites, Zohar, Lithuania, History of East European Jews, and much more.